Échanger du savoir c'est créer du savoir. Knowledge exchange is knowledge creation. 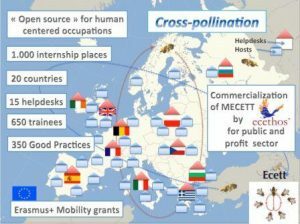 Ecett-Networks is a European learning network that organises workshops and exchange of knowledge between professionals on the companionship model (MECETT method). The sectors concerned in priority are “Youth”, Social Work” and “Addiction”. Ecett-Networks counts thousands places of expertise in Europe, ready to exchange knowledge and builds a catalog of places for internships and a directory of good practices written by our interns about their hosts. Ecett-Networks offers learners a common learning platform and tools facilitating exchanges of knowledge as well as a “helpdesk” to accompany interns and to follow their evolution. Your institution is ready to exchange good practices? Your helpdesk will guide you, step by step, to organize an effective trip in terms of discoveries of good practice and will be there to guide you. Adapt to social, economic and technological context that is changing at high speed and where it is more and more difficult to achieve assigned objectives. Achieve the objectives with fewer resources and less time available. If this is your case, get out of blocked situations and find a new breath! Take a step back, look at professionals elsewhere who practice a similar job as yours but in a slightly different way and in a different context. . The Ecett learning network is designed for members of the partner organisation of Ecett-Networks:addictions, social work and youth or education. B. If this is not the case, your organisation can sign an agreement to join Ecett-Networks. We seek with you how to overcome the obstacles related to language, mobility, etc. You may travel alone or with several colleagues. You are accompanied by a helpdesk before and after the trip in order to optimize the impact of your internship. This trip, you build it with us . . . Any questions? . . . We have the network! We put you in touch with other institutions which have developed Good Practices (GP) in your field. You remain the main actor of your research but we help you identify and name the problem you are facing and formulate your questions. We propose one or several institutions of our Ecett partners network. B = Individual targeted internships with the writing of a Good Practice. C = Three “B” internships in 3 institutions with presentation of 3 Good Practices and an implementation project. D = Implementation of an innovative practice at your workplace, i.e. your Ecett masterpiece. To become a member of Pour devenir membre of Ecett-Networks, simply send your motivated request à contact@ecett.eu; membership is free. You will be contacted by our helpdesk to sign the partnership agreement. Summary. On this site, you will find . . . .